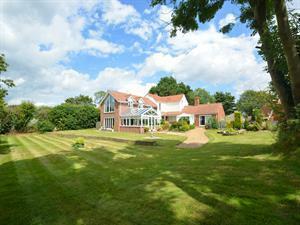 Oak House01263 715779work01603 870304fax Self-cateringEnjoy holidaying in comfort and style here at Oak House. Set within a quiet location in the village of Buxton, which has the National Broads Park and the stunning Norfolk coastline at its doorstep, Oak House provides a perfect base for a relaxing holiday with the family. Equipped with a childs playroom, wooden tree house and plenty of lawn for the children to run off steam, you can unwind in the comfort of the sitting room with a book, soak up the sun the garden or take a cheeky nap in the hammock. If you enjoy walking there is plenty on offer within the surrounding area, walking to Buxton Mill and along the water meadows is very pleasant. Children may enjoy a trip from neighbouring Aylsham to Wroxham along the Bure Valley railway, and for further exploring you can book a dual ticket which provides you with a trip along the Broads on a tour boat. Switch off in the evening with a cool glass of something in the comfortable and inviting surroundings of Oak House. • Luxuries: Smart TV, DVD player, iPod dock, DAB radio, games console. • Standard: Kettle, Toaster, Iron, Travel cot, Highchair. Welcome tray. • Other: Towels. Books and games provided. WiFi. • Outdoors: Fully enclosed garden with charcoal barbeque, covered pond, wooden tree house, hammock, table and chairs. • Access: Parking for 6 cars. • Notes: Please be aware that children should be supervised at all times whilst playing in the wooden tree house and near the covered pond. Enjoy holidaying in comfort and style here at Oak House. Set within a quiet location in the village of Buxton, which has the National Broads Park and the stunning Norfolk coastline at its doorstep, Oak House provides a perfect base for a relaxing holiday with the family. Equipped with a childs playroom, wooden tree house and plenty of lawn for the children to run off steam, you can unwind in the comfort of the sitting room with a book, soak up the sun the garden or take a cheeky nap in the hammock. If you enjoy walking there is plenty on offer within the surrounding area, walking to Buxton Mill and along the water meadows is very pleasant. Children may enjoy a trip from neighbouring Aylsham to Wroxham along the Bure Valley railway, and for further exploring you can book a dual ticket which provides you with a trip along the Broads on a tour boat. Switch off in the evening with a cool glass of something in the comfortable and inviting surroundings of Oak House.